Photo credit: Twitter | @HayatHa33394572. For a third consecutive day, France is seeing nationwide protests against the increase of diesel and petrol prices. 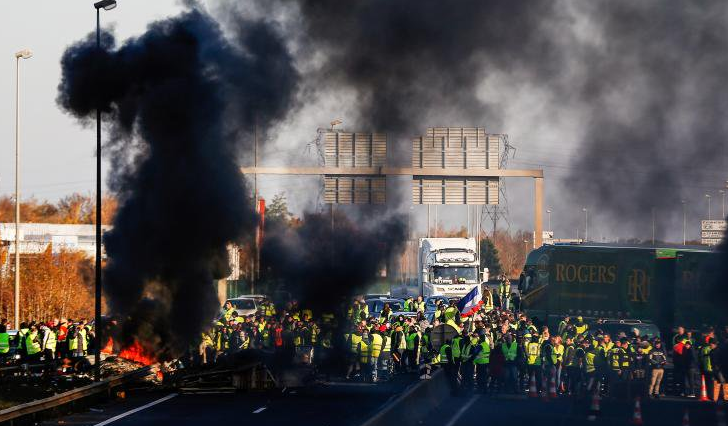 The demonstrators dressed in yellow fluo jackets (called the ‘gilets jaunes’) have blocked access to fuel depots in several places and setup roadblocks all over the country. In certain rural places, farmers have joined in the protest, blocking access to various city centres. The government refuses to give in. The oil company Total reported that two major French fuel depots have been blocked, in Vern near Rennes and Fos-sur-mer (Bouches-du-Rhône). The group's refineries have not yet been affected. Related coverage: <a href="http://thegoldwater.com/news/42633-France-283-000-Tax-Protesters-Tear-Gas-In-Paris-227-Wounded-Video"> France – 283,000 Tax Protesters, Tear Gas In Paris, 227 Wounded (Video)</a>. If the protest persists, several fuel pumps will run out of fuel by tomorrow. Traffic is hindered by protests at various places in the country. In Calais, there are filter blockades on the A16, which leads to delays over several kilometers. In Auvergne-Rhône-Alpes, the "yellow vests" are blocking the toll station of Limas on the A6, causing several miles of traffic jams. There is also traffic disruption on the A6 south of Chalon-sur-Saône, on the A7 in Orange, Avignon and Bollène. The protests against high fuel prices are mainly organized via social media. On the first big day of action last Saturday, an estimated 300,000 people participated in actions in about 2,000 different places. There are calls for another big day of actions on Saturday 24 November. The protests of the past weekend unfortunately had dramatic consequences as well. A female demonstrator died on Saturday morning in the department of Savoie when a woman who was on her way to the doctor with her daughter became panicked when demonstrators started to knock on her car. The woman drove into the groups of 'yellow vests' and hit a 63-year-old demonstrator who died. Elsewhere, 409 were injured, 14 of whom remain in hospital at this point. Police has arrested 282 people for rebellion or because they tried to break the blockades of demonstrators. The protests have by now spread to Belgium as well and even in the south of Germany there are calls on social media to participate. How`s that new world order/globalist agenda working out for you? We all die at some point… Where do you think you & your kind will go? Paradise with your most carnal desires fulfilled?